Happy almost Friday! It’s been a busy week but I finally sat down to write this post. After I read Jen’s post about her 7 years of blogging I searched my archives and realized that yesterday marked my 6th year per this old post since I apparently deleted my first blog post. Coincidentally, earlier this week one of my readers (hi Sunitha!) messaged me and shared that she has been following me and my blog since the very beginning. This struck a cord with me since loyalty seems so elusive in this age of follow and unfollow. It’s difficult to grow organically but what she said is a reminder to never take you guys for granted, stay true to myself and keep on delivering what you enjoy seeing and reading from my little space on the Internet. I’ve become blogging friends with some very special ladies and I’ve cheered for their successes. I’ve made the sweetest online friends that I’ve enjoyed getting to know through chat and email. I got to take over LOFT’s instagram stories for one day last year and I recently got to work with Ann Taylor all thanks to your support. I am thankful for having such a supportive community to share things with and I appreciate you for taking the time to read my posts and trust my reviews. 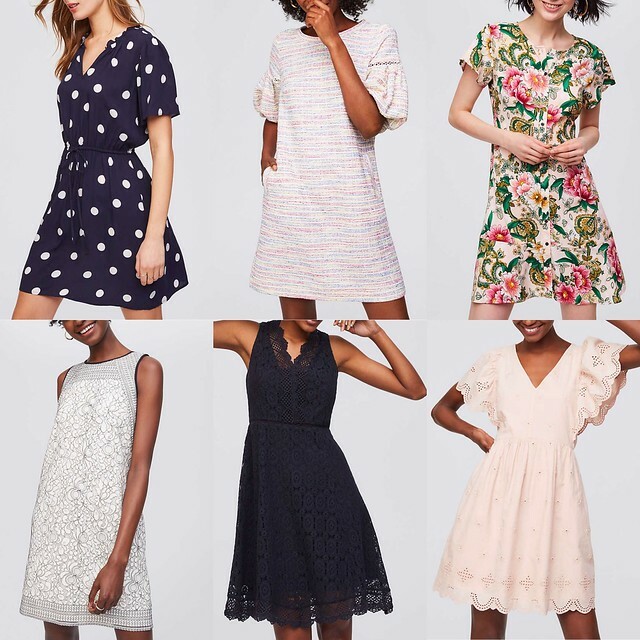 There are a lot of spring new arrivals and these days I feel like I am forever browsing LOFT’s website for fear of missing out. The workaround for FREE shipping on orders of $50+ (old post so please ignore the sale alert in the post) stopped working around late afternoon yesterday. Hopefully LOFT will bring it back again soon. Get an extra 40% off sale styles at LOFT. Full-price dresses are $49.50 (excludes Lou & Grey styles) and get 40% off outfit-makers. Since no code is needed for select full-price categories on promotion you can use code FEB419CC to save an extra $50 off $100+ as mentioned in this post. This code is valid on full-price items and full-price items on promotion. Items from the ‘sale‘ section do not qualify towards the $100 minimum needed in order to apply the $50 discount code. I’m surprised to see that this code is still working now that it’s mid-March. Get an extra 50% off sale styles and 40% off full-price styles at LOFT using the code JACKPOT. Valid in stores and online. Sale ends 3/18 at 3AM ET. FYI. The minimum shipping on orders of $50+ is working again as of 3PM ET. Redeem your LOFT cash now through March 26, 2018 for $25 off every $50+ you spend on full-price promotional items! Online use code LOFTCASH. If you earned LOFT cash between February 12 – March 4 don’t forget to bring them with you when shopping in stores! I linked to an old post here if you need more info regarding LOFT cash. Get 40% off shoes and accessories (use code STEPTOIT) and get an extra 40% off sale styles at Ann Taylor. I tried these Hartley leather ruffle block heel sandals on for sizing and I needed them in the next half size up. Get 50% off your purchase at Ann Taylor using the code LUCKY50.Valid online only. Sale ends 3/18 at 3AM ET. See size XS regular on Lilly. I found that the v-neck on this top runs very low so a camisole is require for more coverage. My usual size XSP fits very loose so I would suggest going down one size for a better fit. I love the double frayed hem on these jeans for some added interest. I found they fit true to size in size 25/0P and they were not see through. Unfortunately there were a lot of lines and rippling across my thighs in the back so they pants didn’t look as smooth across my legs as I prefer. 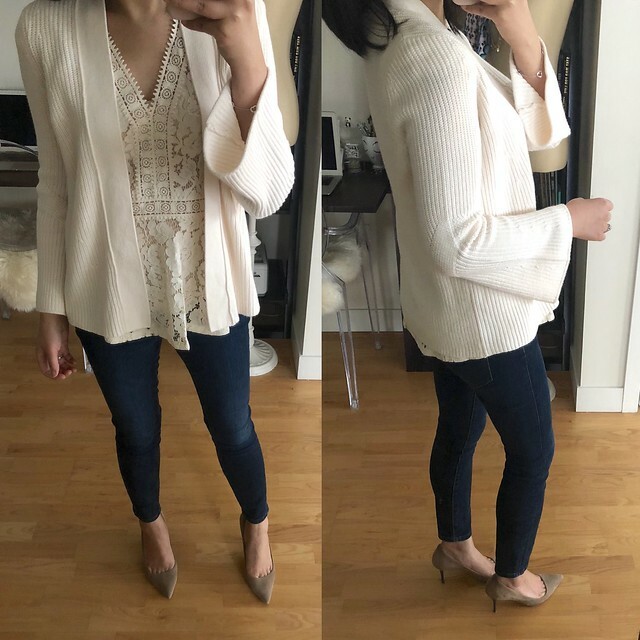 This is a cute spring jacket and it runs true to size to slightly larger. I took size XXSP which has narrow shoulders (I have 14″ shoulders) but otherwise size XXSP fit like size XSP. I have an obsession with utility jackets so I will have to decide if I really need this one or not. See size 0 regular on Lilly. I saw this dress on Lilly in her blog post last week and I was excited to see it online. I found that this dress runs one size bigger if you view the clip I shared here. I would need this dress in size 00 petite since size 0P fits like a loose size 2P. 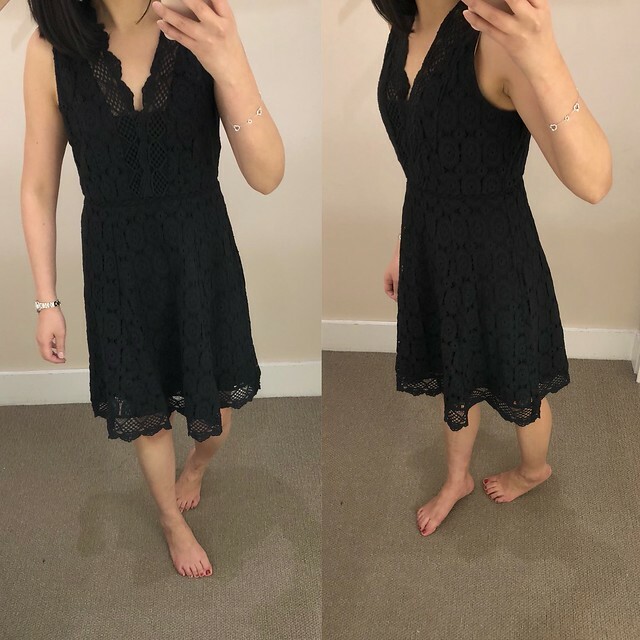 Update 3/20: I tried on size 00P this past weekend but the dress fits like a loose size 0P. It is very generous in the chest. This cami runs really long but otherwise size XXSP fits true to size and it’s narrow in the chest but it works for me since I have a smaller bust (size 32A). As another reviewer mentioned you can definitely see the seam down the front and sides taking away from the clean look. I love the button details in front but I wish the cami wasn’t tunic length. As always LOFT’s whisper white color is not a true white but an ivory/cream color. 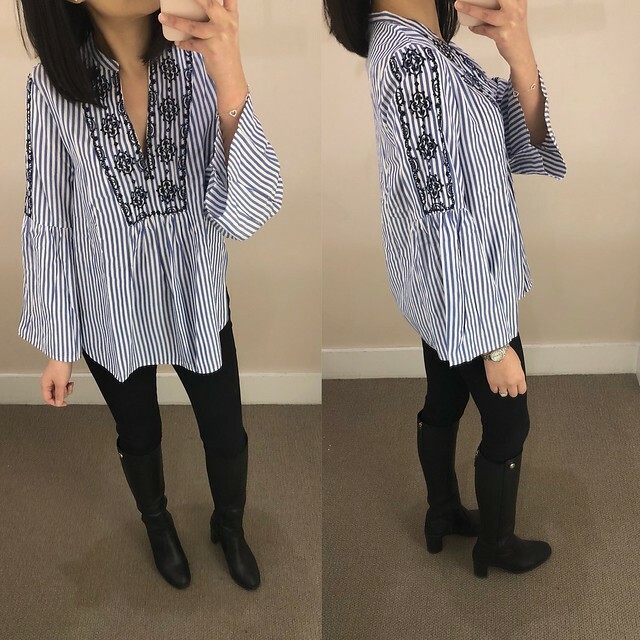 I love this stripe blouse and I found that it has a loose boxy fit so it looks best with a front tuck. Size XXSP fits like a loose size XSP so I would recommend sizing down for a better fit. 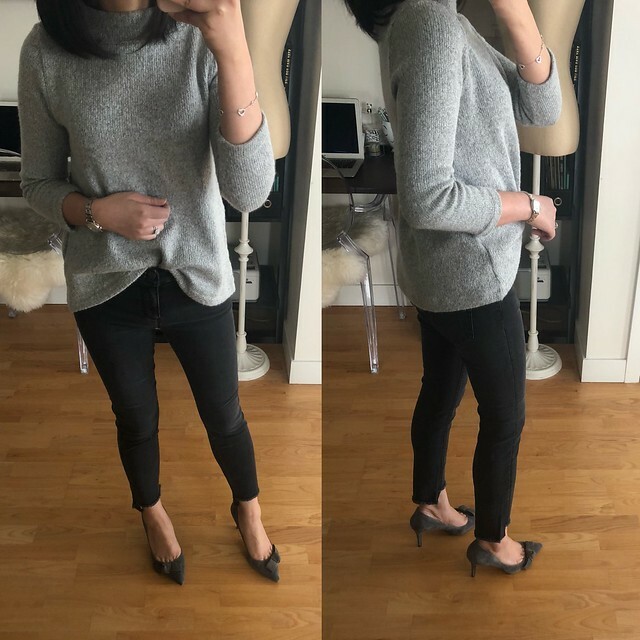 I love this top paired with black and dark grey denim as seen here. 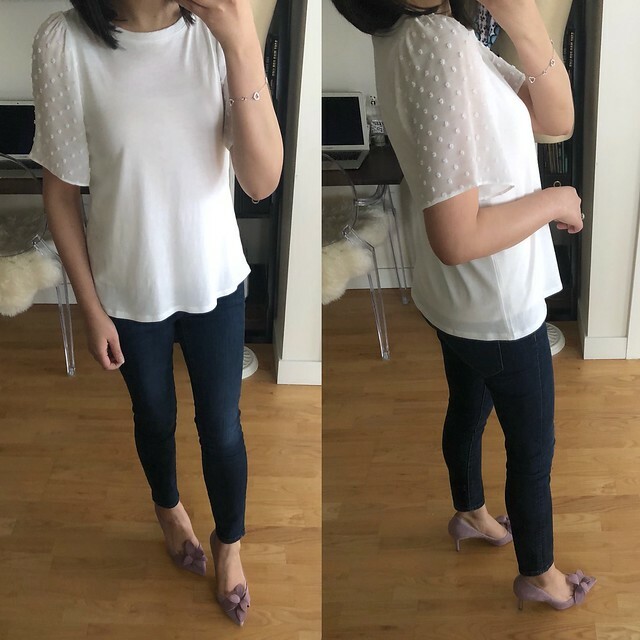 I was deciding between which size to keep in this dotted top but after trying it on multiple times I decided that I prefer the fuller length sleeves of my usual size XXS regular. The top is lined so it is not see through. This top may be too wide and short for some people’s preference so I’m sure you’ll see sizes pop back as people change their minds. 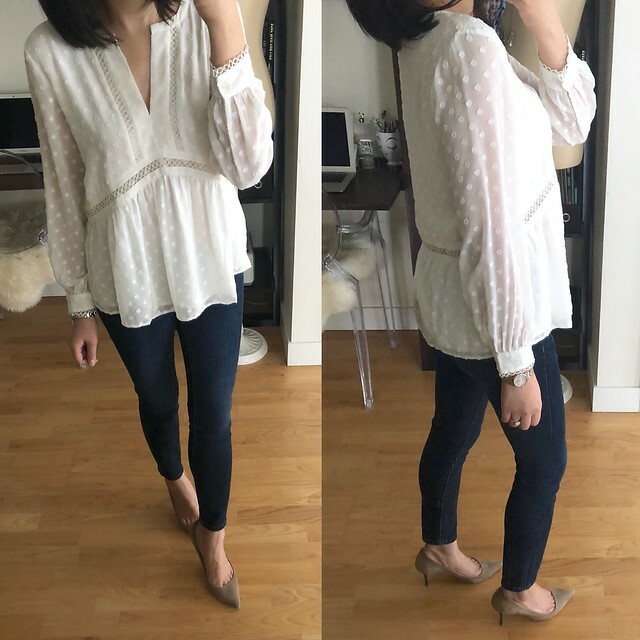 Since I have a small build even the next size up looked fine on me (refer to my review of size XS regular here). Size XXSP fit me as well but the sleeves were 3/4 length on me. The shoulders were a bit too narrow on me for comfort when I moved around. 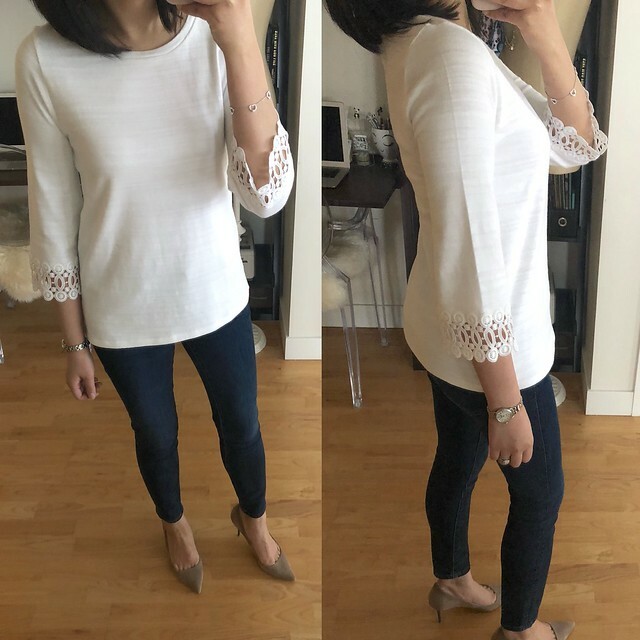 I love this lacy bell sleeve tee which is similar to last year’s version I reviewed here. This year’s size XXSP fits like size XSP and I like that the thicker slub knit material is not see through. 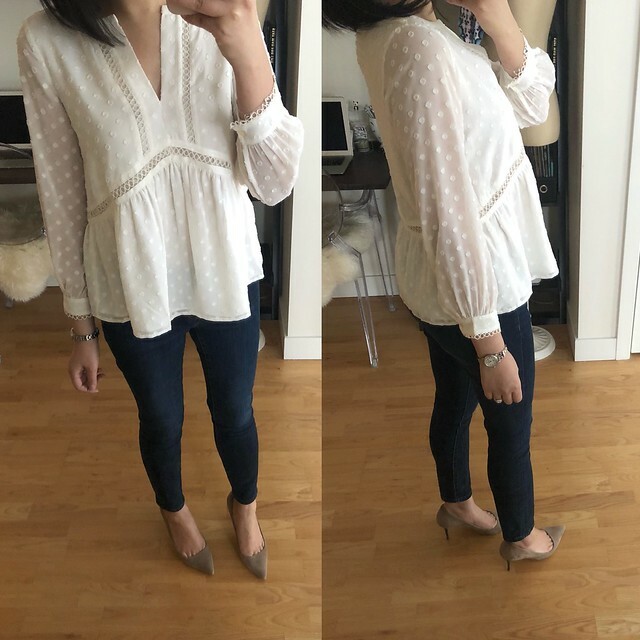 I love the swiss dot sleeves on this top by the material is really sheer and requires a layering cami which ruins the look for me. It is also available in navy here. The material is very thin so it’s probably the kind of fabric that will mysteriously get holes in it after a few wears and washes. I recently had to throw away one of my thin tees last from year so it’s just a gentle reminder to myself that I need to be pickier about the material. I ordered this cardigan as recommended by Su. I took my usual size XXS regular and I found that it fits true to size. The sleeves are a bit short but I love the mid-hip length for layering it over sleeveless tops. 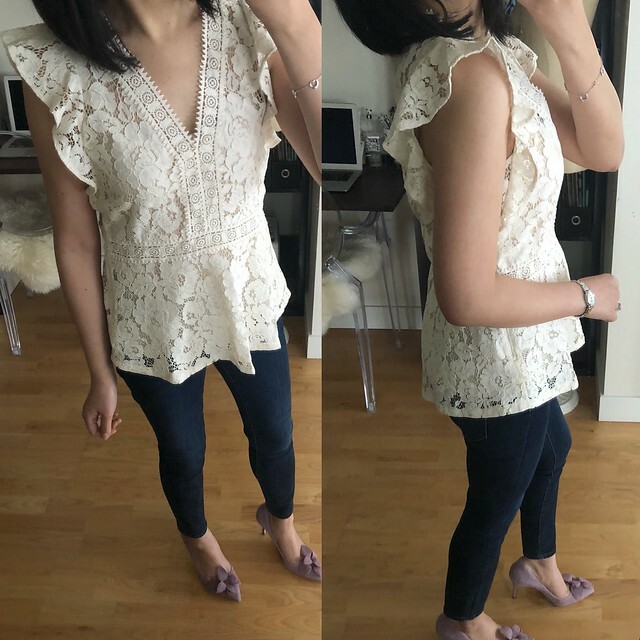 I love the gorgeous lace details of this top but I’m on the fence about the ruffle details on the shoulders. For this reason I prefer this top with a cardigan over it to cover the shoulders. My usual size 00 regular fit me well. Note that the lace top is unlined so a layering cami is recommended. 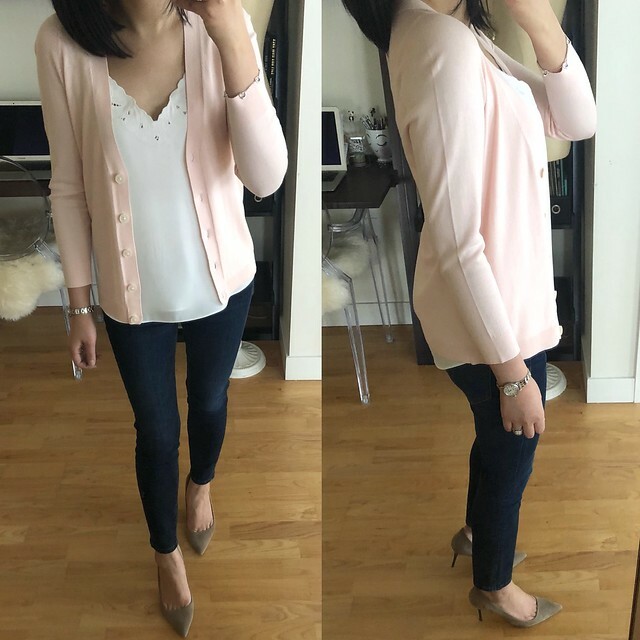 I love a good 3/4 sleeve cardigan and the v-neck when worn open is not as awkward as a round collar cardigan for some of the necklines that I prefer to wear. I fit my usual size XXS regular. If you prefer to button your cardigans then you may want to size up. 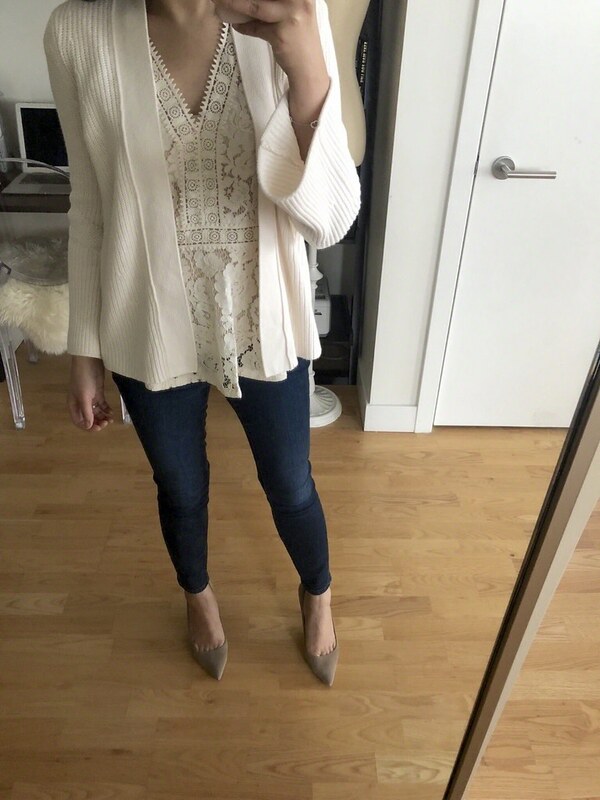 I wanted to love this cardigan but I ended up returning it because I didn’t like how sheer it was. It fits true to size for a relaxed fit in my usual size XSP. 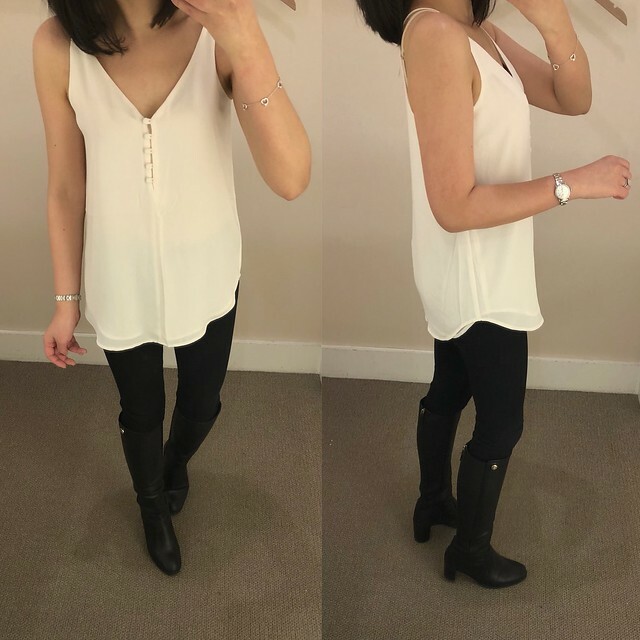 It would be great over sleeveless dresses in the summer but I didn’t like the outline of my tops peeking through the back and side view. 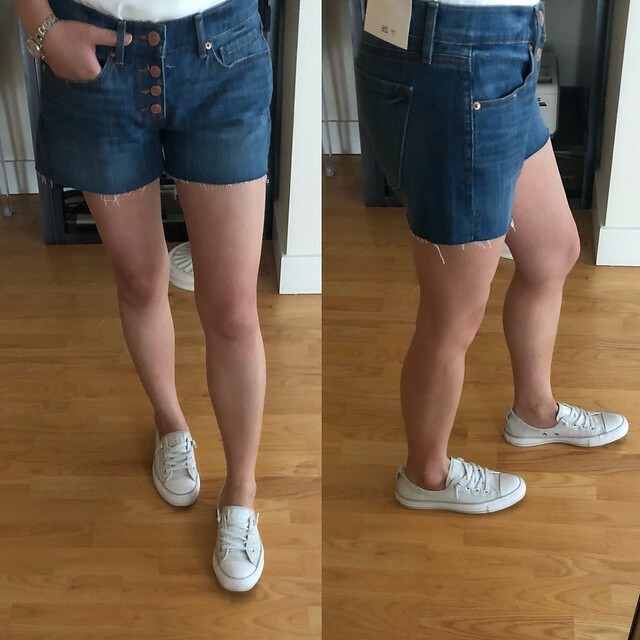 These button fly jeans are very popular among other bloggers I follow but the petite inseam is very short (review of size 25/0P here). I finally got around to trying on size 25 regular for comparison. Size 25 regular has a 28″ waist and 27″ inseam which is about one inch longer than I prefer. I’m 5′ 2.5″ and I prefer a 26-26.5″ inseam at the most. Courtney is 5’4″ and I recall her saying that size 25 regular fit her. These button fly jeans run big. 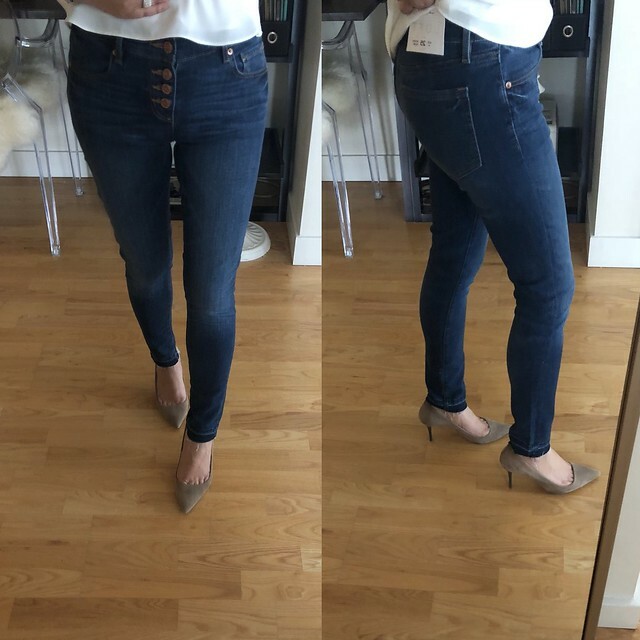 Size 25 regular has a 32″ waist so they were very loose on me. I would need to try them in size 24 regular to see if they fit better. 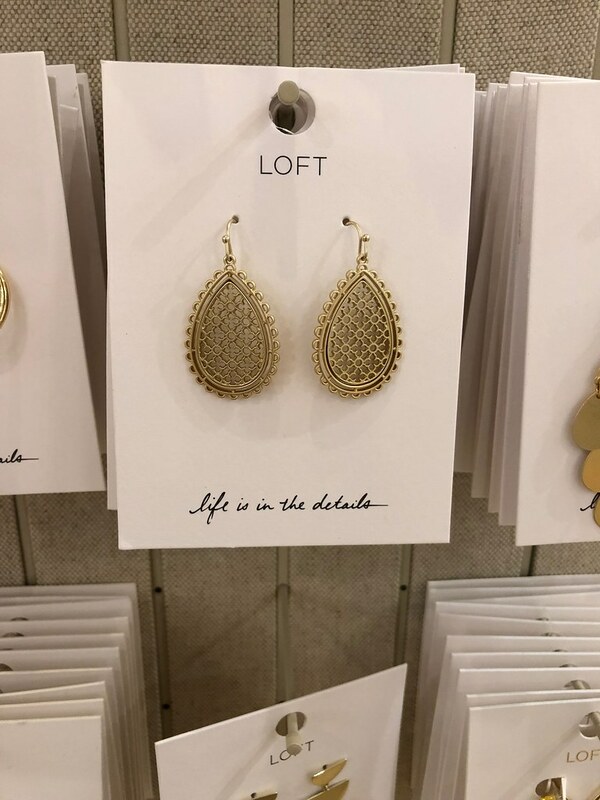 I love the intricate detail of these earrings and they remind me of my favorite filigree earrings from last year as seen here. 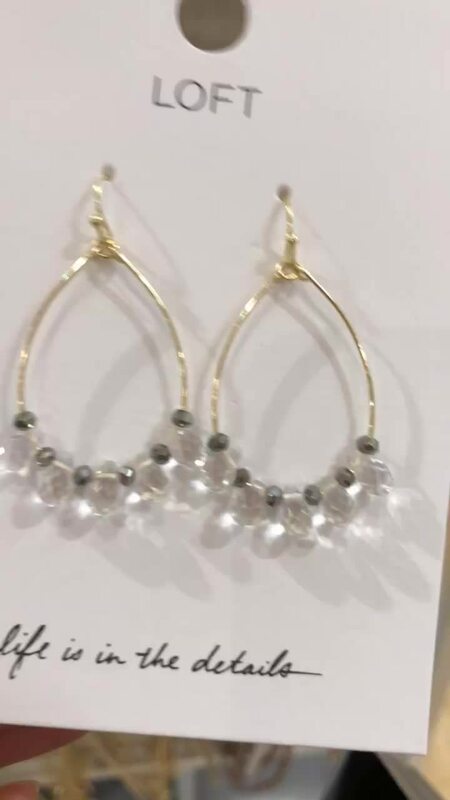 These hoop earrings are really pretty in person and they also have a matching necklace. 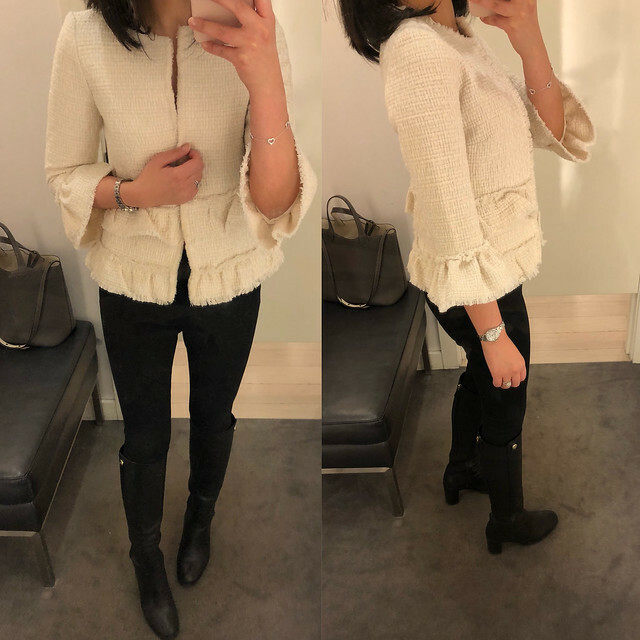 I tried on this top last weekend and I just noticed that it’s now available for purchase online. Size XS regular fit me well but the band around my upper arm is a bit snug. I wanted to try it in the next size up for comparison but I do like the fit and length of size XS regular. The top is white and the material is thicker so it is not see through. 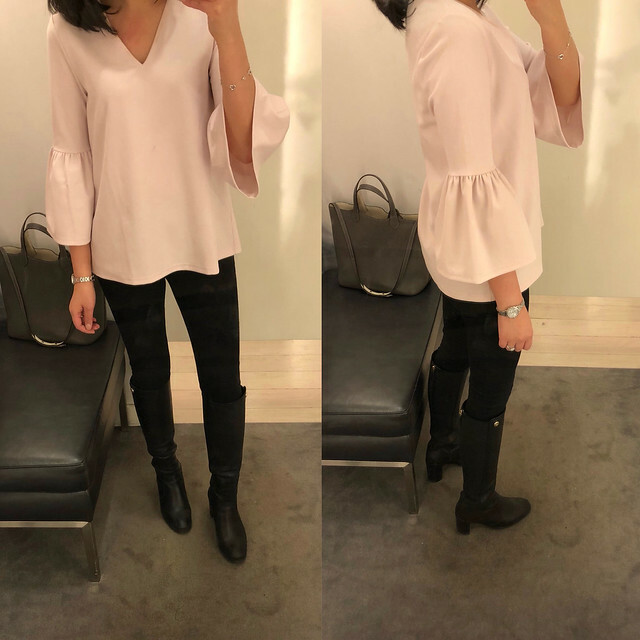 This is a cute bell sleeve top and size XS regular was a bit loose on me so I would prefer my usual size XXS regular for the best fit. The material is thicker so it is not see through. I like that the v-neck is not too low on this top. I tried on size 00P for sizing and the shoulders run narrow and the sleeves were too tight so I would say it fits true to size. The sleeves were too tight when I bent my elbows as you can see here. Lilly also tried on this tweed jacket in size 2. 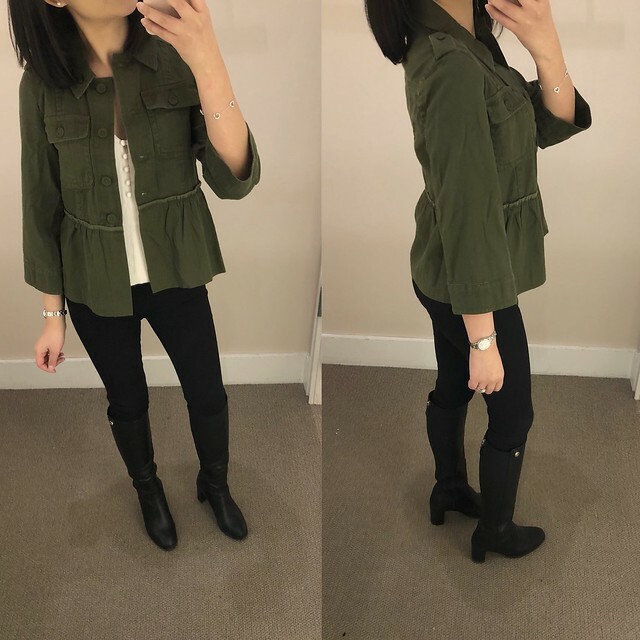 Update 3/20: I tried on this jacket in my usual size 0P this past weekend and it fit well with just enough room in the sleeves to move and bend my arms comfortably. 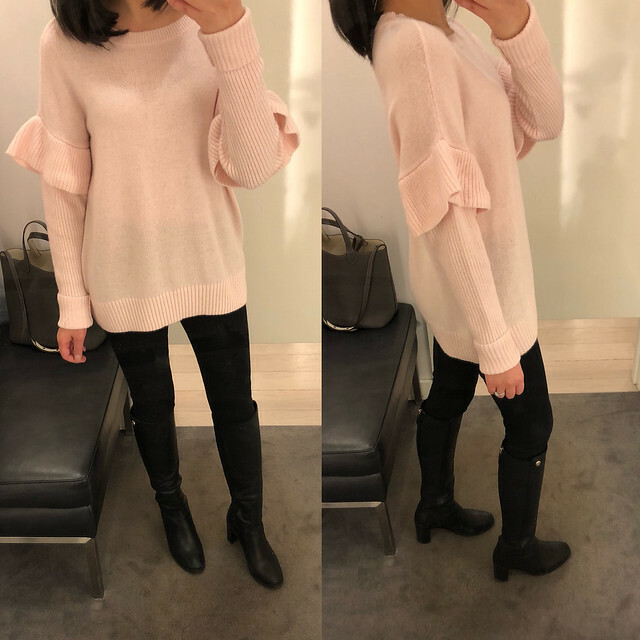 This sweater is really cute and it runs true to size. I took my usual size XXS regular below but I would have preferred size XS regular for a slightly looser fit. I tired on size M regular above out of curiosity but it was too oversized. Note that the light pink color is sheer (you can see the outline of my jeans) so a layering cami is recommended. Su tried on the cherry color here in size SP I believe which is comparable to size XS regular. The sweater contains 50% wool but I didn’t find it to be itchy. The above picture is a better view of the peach blush color in good lighting. You can see a close up of the taupe color here since the true color is hard to pick up in pictures. These pumps run true to size but they are stiff and narrow fresh out of the box. I ordered size 7.5 based on the online reviews that they ran big but I would need them in my usual size 7. 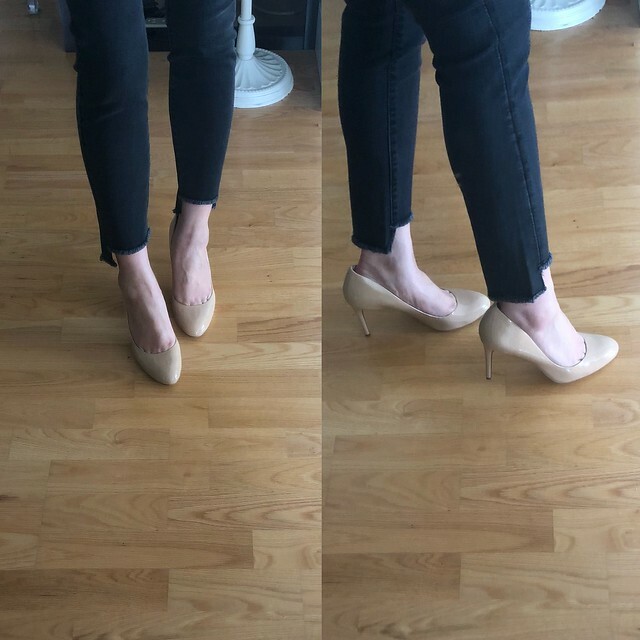 I still have a new-ish pair of my favorite J.Crew Sloane patent pumps from Poshmark so I passed on these pumps since I wasn’t interested in breaking in a new pair of heels.